It’s Astra’s birthday today. And the Bears gather at “Sweet Doves”. A lot of guests come to the party. Husband and wife are joined in a single unit. Goldilocks is playing the violin. Freddy discovered another “elaborately disguised” alien. And got angry. What is your wish, Astra? Dorian asked Astra out on a date. Like any girl, Astra is late. Dorian, what are you looking for? The wedding is in the same café. Baby got a day off to go to the wedding. Thank goodness! The bride’s NOT in black. In the end, we persuaded him to play the piano. Matthew, what have you lost? Here’s your Nespresso – next to Gregory’s chair. Astra moved to the Landgraabs. Freddy and Anna take the opportunity. 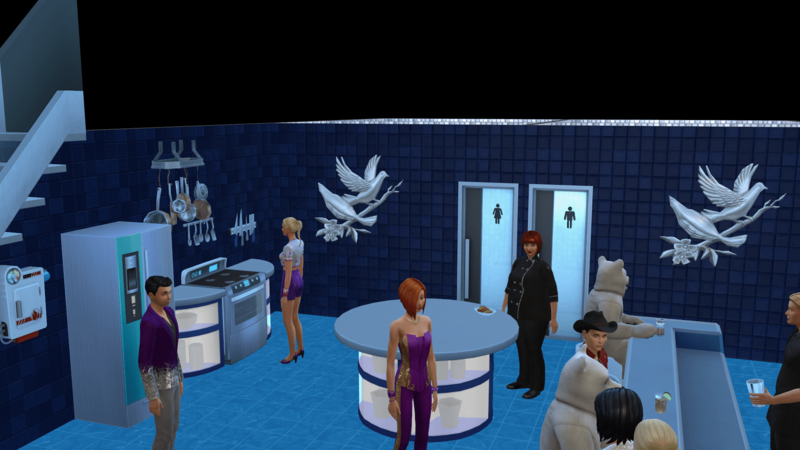 You can watch my sims having fun in the café in this video. Posted on May 20, 2016 by chealsycatPosted in Goldilocks and Bears (Sim fairy tale)Tagged #Goldilocks and Bears, #Sims 4, bears, Goldilocks, Sims.